This week's One Layer Wednesday challenge is hosted by Cheryl. The challenge is to make a card that measures 3x3. I never make cards this size. And I never make tags. And from time to time, as I'm rushing out of the house with a hostess gift, but no tag or at Christmas when I use (gasp!) store-bought tags, I wish I did. They are perfect for showing off smaller images, like this little panel from Magenta that I got years ago. (When I use it on a regular sized card, I usually repeat it, like I did here). I love the intensity of the colour here but you could really colour the tulips any colour you like. Not sure where that sentiment came from, but I thought it was the right scale for the card. You can see that there is still a little bit of warp in the card after I heat embossed - that will relax over time and it will be perfectly flat. I hope. Lovely. Love the bright colors. Small, less than 8cm in my language... I find that a real challenge to go so small. You made it look JUST right! I just did a card I think you will likey too! Have a great weekend Ardyth! I rarely make tags...I seem to struggle with them a ton. 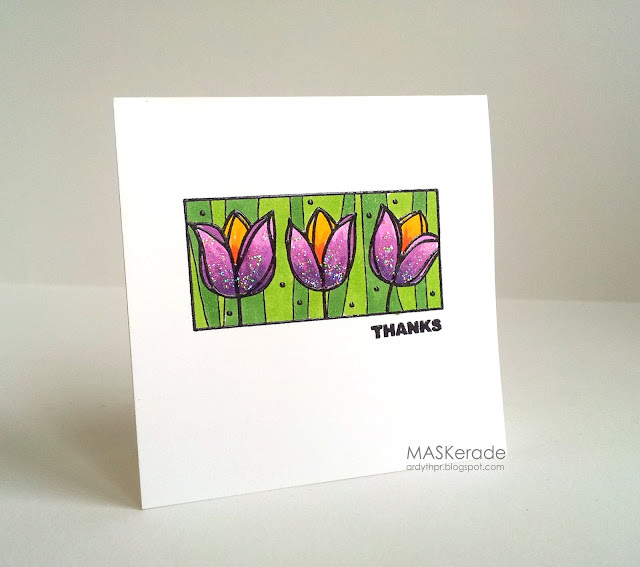 I love this card...the coloring and the touch of shimmer is amazing. First of all Ӏ want to say аωesome blοg! I haԁ a quick question which I'd like to ask if you don't mind. I was intereѕtеԁ to find out how you сentег youгsеlf and cleаr your thoughts prior to ωriting. I've had a tough time clearing my thoughts in getting my thoughts out. I do enjoy writing but it just seems like the first 10 to 15 minutes are lost just trying to figure out how to begin. Any suggestions or tips? Kudos! You are the master of these stained glass type coloring, Ardy! I say it every time, but it takes my breath away every time!! Amazing card...those tulips are stunning. You are so gifted and I always look forward to seeing your amazing creations. Loving this one soooo much! The colors are really vibrant! Didn't know which card to comment on - all of your designs are wonderful! Very inspiring to come here! LOVE the bright happy colors...and the sentiment is just perfect with it. Knowing how much you love glitter, you really need to check out the glitter brushes that I recently got....awesome glitter applicator!! Ardyth, Your card is awesome! I love the bright colors and sparkle!